I am a self-confessed green smoothie addict! I had been very pleased that I have not had a cold, or even so much as sniffle for the last few years, and of course as soon as I got out of my green smoothie habit for a couple of days last week I immediately caught the flu and could not get out of bed for over 2 days. The moral of the story, for me at least, is to make sure I get my daily (raw) greens. And being a freelancer I need to stay in top health at all times. In an effort to bolster my immune system and send the pesky flu on its way Ed made me a super smoothie so packed with fruit and vegetables that it needed to be served from a bowl. I am certainly feeling far far better from a healthy portion of this the last two mornings. As with all smoothies, quantities are approximate. It’s best not to use too many different fruit and vegetables. We find that a maximum of four is about right. If you try this Recipe: Green Thickie – a smoothie like breakfast please tag #FussFreeFlavours on Instagram or Twitter. It is amazing for me when for me when you make one of my recipes and I really do love to see them. You can also share it on my Facebook page. Please pin this recipe to Pinterest too! Thanks for reading Fuss Free Flavours! 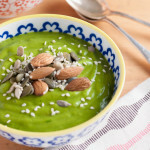 A green smoothie packed with even more vegetables than usual to pack a nutritional punch. 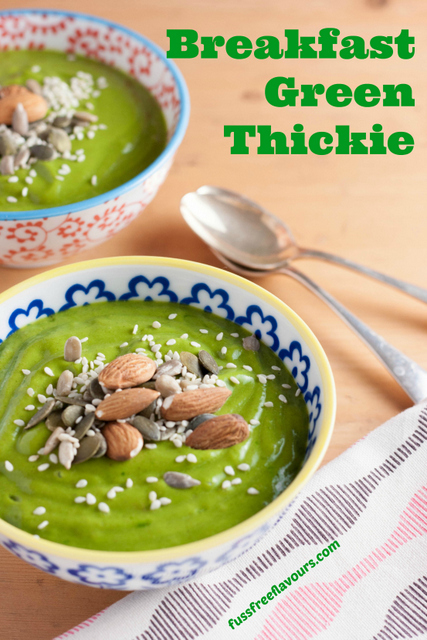 This Green Thickie is perfect for breajfast! Blend the greens, chia seeds, and flax and coconut oils together – give the greens a good long blend to make sure that they’re really smooth. Then add the grapes, butternut squash and banana and blend again until smooth. If the mixture is too thick, add a splash or two of water. Finally, add yoghurt and blitz a few times to make sure it’s well mixed in. Serve in a bowl with a sprinkling of seeds, dried fruit and nuts.